I hadn't of course, but I concede my latest vegetable discovery is a dead ringer for the Arion Ater lurking under the hostas in our garden. One of the earliest things we learnt in our Great Big Veg Challenge was to be brave, not to be frightened of the vegetable unknown. We have tried everything from seaweed, cacti and nettles to bitter gourd and now Black Garlic. Alex discovered them on a stall at MasterChef Live in London's Olympia. 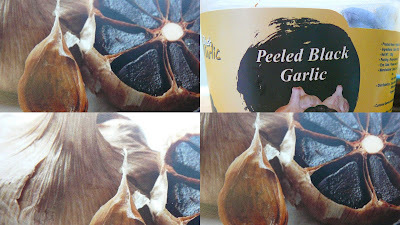 According to the packet, black garlic is aged white garlic. The packaging boasts the only ingredients are regular garlic, heat, humidity and time. So we bought some and brought them home. The little black cloves have the texture of a piece of chewy liquorice. They taste of fermented wine, intense sweet garlic, a touch of liquorice and the bizarre thing is although you are eating whole cloves of garlic, your breath doesn't stink. And in our house, this is a critical issue. My husband has a deep-seated loathing of garlic. His hatred of the stinking-rose extends to cooking smells and particuarly garlicky-breathe. This is a shame, because neither Freddie or Alex have inherited the garlic-hating gene. In fact, when Freddie was a toddler we called him dough-boy in honour of his ability to polish off a plate of Pizza Express garlic dough-balls in record time. So as you can imagine, the prospect of being able to introduce garlic into family-mealtime without causing a rift is very welcome. I baked some Mushroom and Black Garlic Tartlets. (Or if you like Freddie's alternative name, Tarte au Slug). Freddie has learnt to enjoy mushrooms largely because of his friend Bertie's Superb Mushroom Pasta Sauce. (Click HERE to find the recipe - I assure you it can turn round the most ardent mushroom-haters.) Now 'He Who Hates Garlic' has decided that Black Garlic is acceptable. If any of you know any more about black garlic please let me know. I have a pot in the fridge and I need more recipes. 1. Lightly saute mushrooms and shallots in oil for 5 minutes until softened. 5. Line the pastry cases equally and evenly with the mushroom, black garlic and shallot onions. 6. Pour over the egg and milk mixture. Breathe liberally on friends and neighbours afterwards without fear of knocking them out with garlic breathe. I have been reading American fellow bloggers about black garlic and was quite curious about it. I am glad to learn it is avaialbe in the U.K, but am wondering when it will come to Scotland - thank goodness for the internet. Yes I am hoping that it is sold in the supermarket soon - its the sort of thing waitrose might chose to stock. Its a really interesting ingredient. Those look great Charlotte! That garlic is a first for me and something to look out for. My husband is a garlic-hater too! Thanks Jacqueline - it is a great ingredient. It has an extraordinary taste - very distinctive. Thanjk you for that link anon! Will go and explore straight away. It is so good to see you again! So sorry to hear about your injury. I take it that you are a lot better now? Big hugs to the kids and welcome back! Hi Charlotte - I am a fan. Your tartlets look great. I am posting a black garlic risotto in the next day or so. Wow! I cannot wait to try the tartlets. Amazing blog, by the way! I can see that you are an expert at your field! I am launching a website soon, and your information will be very useful for me. Thanks for all your help and wishing you all the success in your business. Please come visit my site Directory San Jose City when you got time. Wow, nice recipe! I am a garlic lover but the black garlic is new to me, got to give it a try. You have a wonderful blog, I am always looking for healthy vegetable dishes to cook and I am glad I stumbled upon your blog. I love tarts especially egg tarts. Hmm... this tartlet will surely smell good coz of the garlic! This is a great recipe for my new diet. I've never heard of black garlic either, i'll have to keep an eye out for it in the grocery store. oh man that black garlic looks amazing.